Soldiers carry the bodies of miners killed by a landslide in a jade mining area in Hpakhant, in Myanmar's Kachin state. Nov. 22, 2015. At least 100 bodies have been recovered and rescue workers in northern Myanmar are pulling more bodies from the rubble Monday, two days after a massive landslide near a jade mine. Reuters reports while friends and family have identified some of the bodies, stacks of unidentified bodies wrapped in blue tarp remain. Nilar Myint, a local township administrator, said about the recovery of bodies: "It's not ending. It's still on going. Local people in town are getting angry, because there are just too many bodies." Officials say at least 100 people are still missing after the collapse. Authorities had said earlier that the dead were miners picking through the waste and tailings for a piece of jade to sell. 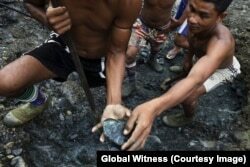 However, authorities say the collapse occurred when many of the miners were sleeping. Tin Swe Myint, head of the Hpakant Township Administration Department said, "We just don't know how many people exactly were buried since we don't have any data on people living there." He described the area where the landslide happened as "just a slum" with "workers living in makeshift tents." Hpakant is in Kachin state, located about 950 kilometers northeast of Yangon, Myanmar's biggest city, and home to some of the world's highest-quality jade. Global Witness, an organization that investigates the misuse of revenue from natural resources, put the value of Myanmar's jade production as high as $31 billion in 2014. The group says "This figure equates to nearly half of the entire country's GDP, and over 46 times national spending on health, yet the local population sees little benefit." According to Global Witness, Myanmar's jade trade is "secretly controlled by networks of military elites, drug lords and crony companies" tied to the country's "darkest days of junta rule." "Their legacy to local people is a dystopian wasteland in which scores of people at a time are buried alive in landslides," Mike Davis of Global Witness said.